"It does not sound or behave like your father's old picture book..."
"Some cows type, these cows ROCK!" 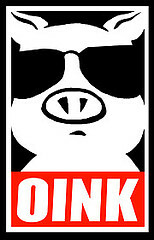 "...outrageously clever and comical gig..."
Hey Punk Farm! Your show was unbelievable! Come back to Colorado soon and play more shows!!!!! Ah man!!!!! Last night's show just completely ROCKED my face off!!! Most excellent show last night. Most excellent indeed! Hey guys! Did you see me? I was rocking out in the first row! Seriously killer concert, dudes! Leave it to the PF to completely rock the Colorado mountaintops! CLANK, CLANK, CLANK!!!!!! Brilliant!!! Love the new stuff, guys! Oh man, oh man, oh man! You guys are playing near me in a few days! I HAVE to find tickets. You'll see me at the concert, I guarantee it! I've been counting down the days until your Colorado stop. I can't believe that it is almost here... I am ready to ROCK! PIG! I love you so much! Didn't this picture of us come out so cool? Remember I met you after your show in Texas and you were all, "Sure I'll take a picture with you."? That was the BEST!! Y'all were amazing last night! Best show in Texas ever!!!! My feet are tired from all the dancing at your concert last night. Texas loves you, Punk Farm! WOOP! WOOP! en el fuego con ustedes!!! Great show, guys. Y'all come back now soon, ya hear? Hearing you guys perform live made my life complete!!! I have my tickets!!! I'm heading in with some friends and we're ready to rock the night away Punk Farm style. See you at the show tomorrow night! Tottally amazing, spectacular, radical, out of control, mint show last night, dudes and dudettes! The dock will never be the same! Punk Farm is coming to Texas in dos dÍas!!! ¡Que bueno! Last night's concert rocked me right out of my shell! I couldn't help but snap along to the beat!!! "SWISH, SWISH, SWISH!" You speak the truth!!!!! Tomorrow night is the PF show and I am going to sleep all day and ROCK all night!!!!!! I just wanted to drop by and say that I think it is soooo cool that you guys are having your show on the dock. Not everyone thinks of us ocean dwellers when planning their shows! Anyhooo - can't wait to hear you guys live! I'm getting the girls together and we're all getting our hair done for the show. Chicken - you are the best! YOU ROCK!!!!! 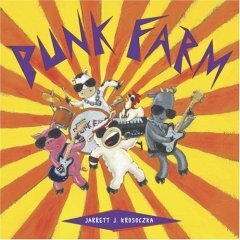 PUNK FARM!!!! Thanks for making the trip all the way up to Maine! My antlers are still ringing! Just checking in to say that you guys ROCKED the old barn last night! Can I get a "Who Who"?! Wicked stellah show last night! Check out my profile pic! I'm att he concert! LOL! Pretty good show. It was cool, I guess. Hey, HEY! I was movin' and groovin' all night long! ALLL THROUGH THE TOOOOOOWN!!!!!! Sweetness! Loved the new material! When will you guys be back?!!!! i went to the show. you rocked some more. punk farm. 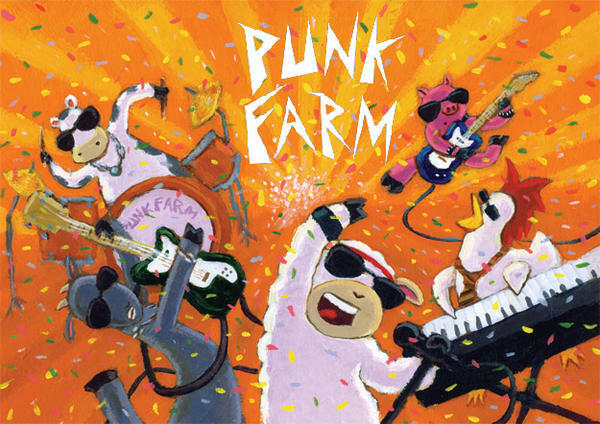 punk farm. Ain't no pahty like a Punk Fahm pahty, 'cuz a Punk Fahm pahty don't quit! I win!!! First comment, first comment!!!! See you in a few weeks! The show is going to be outta control!!!!!! My gf & I will totally be at your show in Maine! Sweetness, PF is coming to my town!!!!! 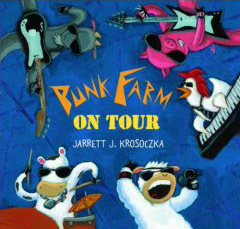 "...Krosoczka's paintings have such a wild, kinetic energy that when Punk Farm is on stage, you can almost hear the music." - Cookie, rated a "Surefire Hit"
"PFot is made of awesomeness...(it) does exactly what a good sequel is supposed to do. It fleshes out the established characters a little more, and takes the themes and conflicts of the first book to a new, deeper level."